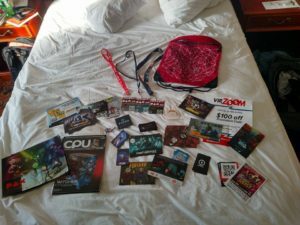 This past weekend I ventured up to Boston, MA where I experienced my first ever trip to the annual Penny Arcade Expo (PAX). 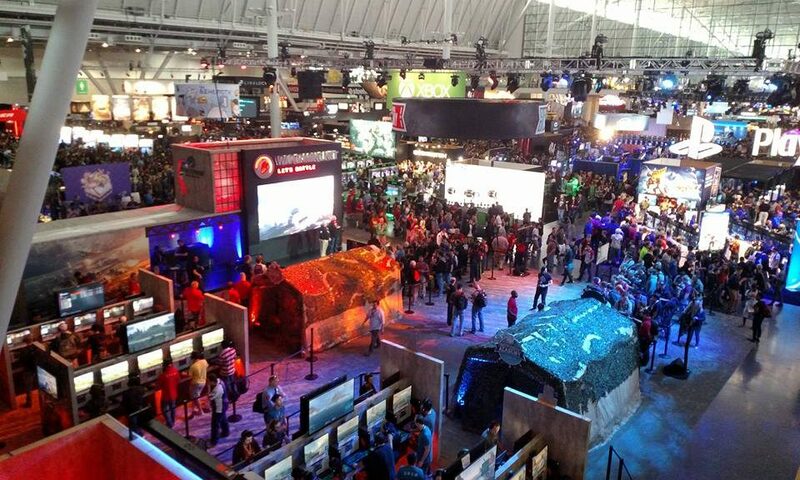 If you’ve never heard of PAX it’s basically a 3 day long massive convention for gamers of all types. I believe there were around 80,000 attendees this year. There are panels and talks along with an expo hall where both AAA and indie studios set up booths and show off their latest games. Most booths give away some sort of promotional material, t-shirts, key chains, flyers, discounts etc. many of these require you to wait in line to play the game. I spent most of my time in the expo hall attempting to see as much as possible which was quite overwhelming at first. One of my main goals was to check out how various studios had set up their booths and to get some hints on the potential costs, just in case I ever wanted to become an exhibitor someday. I saw a wide variety of styles, there were some that were no more than a table, tablecloth and a banner. Completely opposite of those were massive booths made to look like scenes from the studios game (A giant T-Rex for instance). I wasn’t able to get much information from the developers about booth costs. One studio told me that they were actually invited there by PAX themselves so their trip was virtually free. After some research online I’ve seen costs breakdowns as high as $11,000 but I’m guessing building a 20 foot, climbable T-Rex would garner that price tag. For the most part it seemed that everyone was very polite and courteous of others. An accidental bump or nudge while trying to navigate the oceans of people was to be expected. Even the people waiting in lines for hours seemed pretty tolerant to small annoyances that wouldn’t go unnoticed anywhere else. I don’t envy the Enforcers (PAX “security”) though as they were the ones making sure the foot traffic didn’t come to a complete stand still and clog up the aisle ways. As a game designer I didn’t feel that it was important to play each and every game I came across, not only because of the long lines but also because most booths only featured demos where you could play for around 5 minutes. I can’t dig deep into the mechanics or thought processes of the developers while playing a new game for 5 minutes so I thought it was best to watch others play. I also didn’t network as much as I had wanted to but it seemed to not be the type of event to do so as most attendees were not developers but fans or avid gamers. The lack of networking was also probably attributed to my sometimes introverted personality, I will seek out advice from more experienced PAX veterans next time I attend. That next time may be a while away because I didn’t quite realize how expensive it was to just go as an attendee. After the whole trip was over I had probably spent around $1000 but considering I had never been before and it has always been something I’ve wanted to do I decided that it was worth it. Next year I may opt to go to GDC instead.